Prototype 1 (P1) – These are purpose-built race cars powered by a 6.0-liter normally aspirated or 4.0-liter turbocharged engine. The vehicles can weigh no less than 924-kilograms (approximately 2,040-pounds). 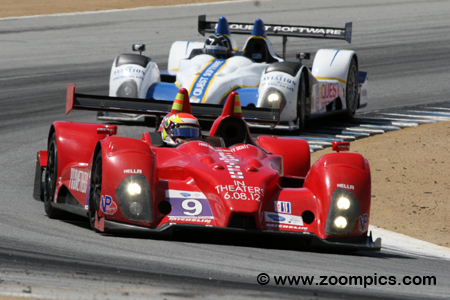 Teams enter cars such as the Lola B12/60, HPD ARX-03a and Lola B11/66. The prototype teams can choose from a number of different engine manufacturers. Typically, these motors produce between 600-700 horsepower. Teams that enter the full season are awarded points towards team championships. The championship-winning teams in P1, P2 and GT earn an automatic entry to the 2013 24 Hours of Le Mans. 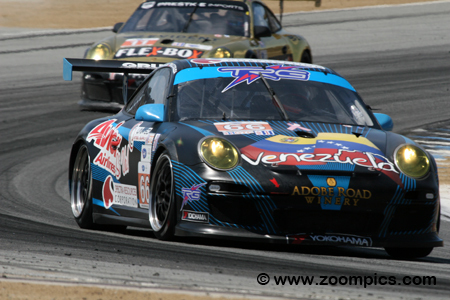 The third round of the 2012 American Le Mans Series was conducted at Mazda Raceway Laguna Seca. The race was six hours in length on the eleven-turn 2.238-mile road course. 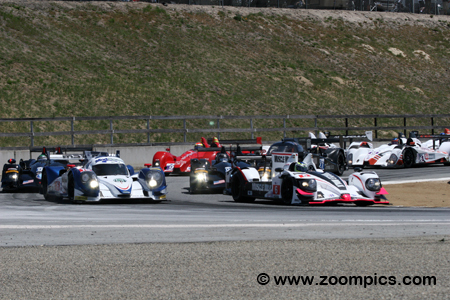 Sixteen Prototype entries enter the final turn (corner eleven) at Mazda Raceway Laguna Seca in anticipation of a start for round three of the 2012 American Le Mans Series. 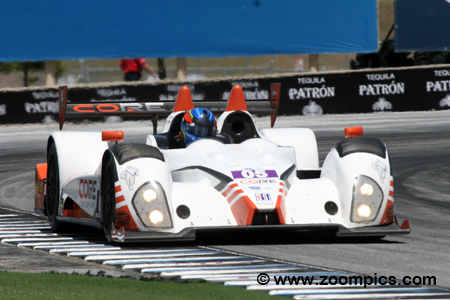 On the pole is the P1 HPD ARX-03a from Pickett Racing and driven by Lucas Luhr and Klaus Graf. Occupying the outside of the front row is the P1 Lola B12/60 shared by Chris Dyson and Guy Smith. Unfortunately, there were only two P1 entries – the Muscle Milk HPD ARX-03a and the Dyson Lola B12/60. And, it was the Muscle Milk Honda that dominated the weekend. Drivers, Klaus Graf and Lucas Luhr, were the fastest car on the track in the two practice sessions and qualifying. In fact, Graf was 1.785-seconds quicker than the second-place starter. Needless to say, the pair led flag-to-flag and won by a margin of three laps. The Corvettes were quick in the first practice session but by qualifying the Aston Martin topped the timesheets. Starting second in the GT category would be the No. 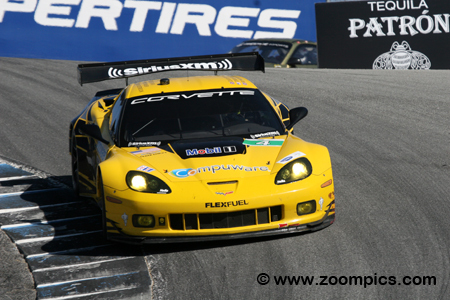 4 Chevrolet Corvette C6 ZR1 with Oliver Gavin and Tommy Milner at the wheel. The duo ran with leaders until a poor pit-stop dropped them to sixth in class. Aggressive but calculated passes moved the pair to the front and they scored the victory. The No. 66 Racer's Group Porsche 911 GT3 Cup entry was shared by Bret Curtis, Emilio Di Guida and Jeroen Bleekemolen. The trio did not top the timesheets during the two practice sessions or qualifying but they were always up to speed. The Porsche started thirtieth overall and third in class. A combination of a great pit strategy and consistent driving gave the TRG Porsche their first victory of the season. CORE Autosport team principal, Jon Bennett and his co-driver, Colin Braun were not on pace during qualifying. Their No. 05 ORECA FLM09 was gridded sixth in Prototype Challenge and eleventh overall for the start of round three. The poor starting position seemed to be of little consequence to the duo. During the race, they moved through the field and a late race pass by Braun on the class leader, Bruno Junqueira gave them the victory. The Aston Martin team gave notice in the second practice session that they would be a team to reckon with and in qualifying, Darren Turner claimed the GT pole. Sharing the Aston Martin Vantage GTE with Turner were Adrian Fernandez and Stefan Mucke. Issues during the race prevented the trio from staying with the leaders. At the checker, they were two laps behind the class winners in eighth place. 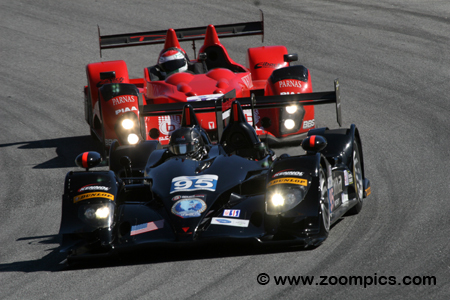 Scott Tucker entered two HPD ARX03bs in the P2 category to ensure his chances of securing the 2012 class title. Sharing the No. 95 entry with Tucker were Luiz Diaz and Franck Montagny. Montagny handled the qualifying and was second quickest. With thirty minutes remaining in the event, they were running second in P2 but a transmission issue slowed the class-leading Morgan and gave the trio the victory. 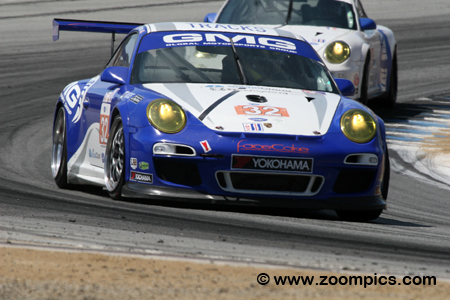 Finishing second in the GTC category was the Global Motorsport Group Porsche 911 GT3 Cup. Drivers, James Sofronas, Alex Welch and Rene Villeneuve, didn’t demonstrate any great speed during practice and qualifying. For the start of the race, they were gridded at the back of the field – thirty-fourth overall and seventh in their category. The team’s performance turned around during the race and the trio finished second in class. The Prototypes and Grand Touring cars were separated for the start round three. The Prototypes were first to receive the Starter’s flag. 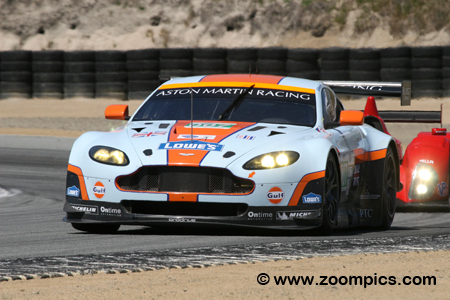 Entering the final corner at Mazda Raceway Laguna Seca is the pole-winning Aston Martin Racing Aston Martin Vantage which would be piloted by Adrian Fernandez, Darren Turner and Stefan Mucke. 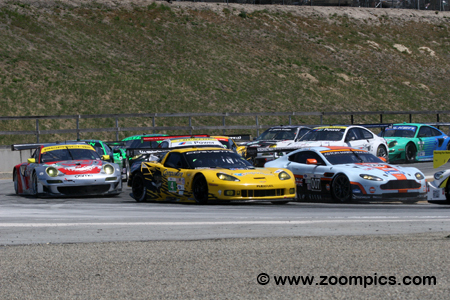 Sharing the front row is Corvette Racing’s Oliver Gavin and Tommy Milner. 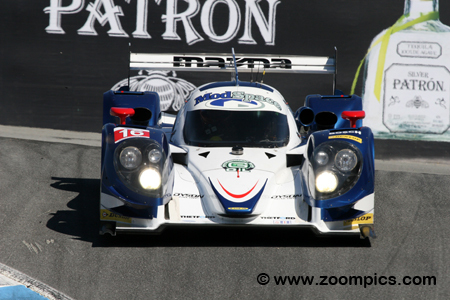 The second P1 entry was the Dyson Racing Lola B12/60 powered by a Mazda engine. The team was still coming to grips with the new Lola and the drivers, Chris Dyson and Guy Smith were slower than the P2 Level 5 Hondas in the second practice session. In qualifying, Smith recorded the second fastest time but it was not on pace with the pole-winner Muscle Milk Honda. The team finished a distant twenty-third overall the six-hour race. Driving the No. 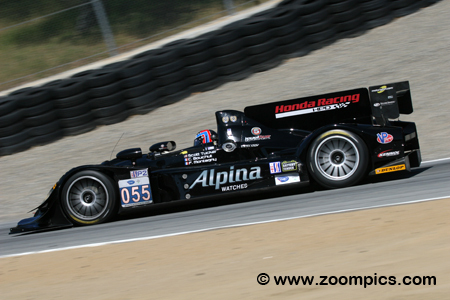 055 Level 5 Motorsports HPD ARX-03b was team principal, Scott Tucker, Christophe Bouchut and Franck Montagny. Bouchut performed the qualifying duties and put the Honda on the P2 pole – third overall. Unfortunately, the No. 055 entry had an issue with a slower car in traffic and fell out of contention. They finished third in the P2 category but were thirty-two-laps behind their teammates. Jan Magnussen drove the No. 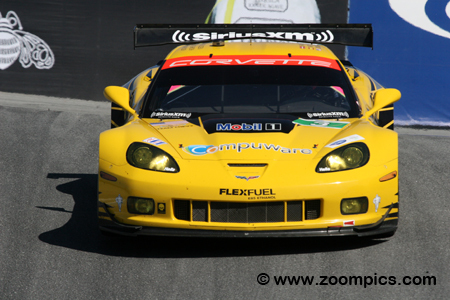 3 Chevrolet Corvette C6 ZR1 in qualifying and was just 0.690-seconds slower than the pole-sitter, Darren Turner. Demonstrating just how competitive the GT category is, Magnussen’s time was only good enough for fifth in class. Magnussen and his driving partner, Antonio Garcia turned in a solid performance a claimed the runner-up position in the GT category. Former Indy Car driver, Bruno Junqueira secured his second Prototype Challenge pole position of the season by just 0.225-seconds. Junqueira driving the No. 9 RSR Racing ORECA FLM09 would share the car with Roberto Gonzalez and series regular, Tomy Drissi. The trio led the class but were unable to hold off the CORE Autosport entry of Jonathan Bennett and Colin Braun late in the event and finished second. In qualifying, four different manufacturers were represented in the top four qualifying positions. Staring third in GT class was the No. 55 BMW Team RLL BMW M3 shared by Jorg Muller and Bill Auberlen. The pair delivered a solid performance and were third in their category at the checkered flag. This result was some redemption for their miserable showing in the previous round at Long Beach where they were eleventh in class. 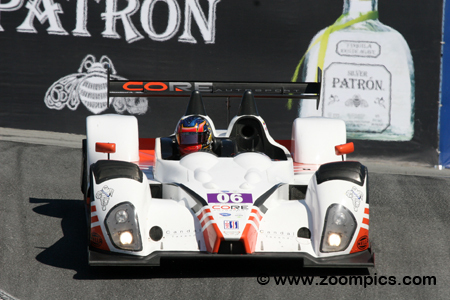 The second CORE Autosport ORECA FLM09 was driven by series regular Alex Popow and newcomer, Tom Kimber-Smith. Kimber-Smith proved to be very quick in his first visit to Mazda Raceway Laguna Seca – he was second fastest during the Prototype Challenge qualifying session. The pair led the first half of the race but lost the position. 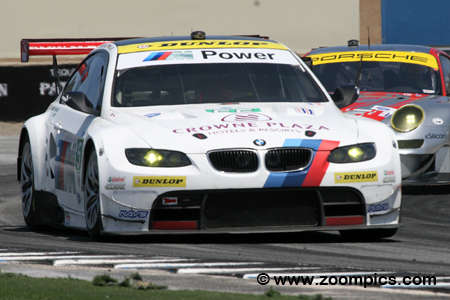 They finished third in their category and fifth overall thanks to a last lap pass by Kimber-Smith. Qualifying on the GTC pole was Sebastiaan Bleekemolen in the No. 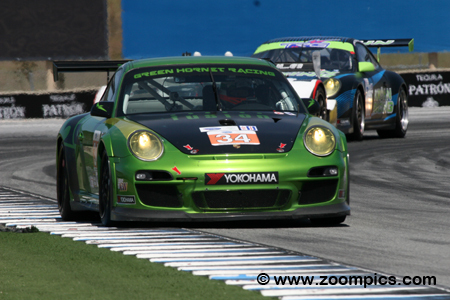 34 Green Hornet Racing Porsche 911 GT3 Cup. Partnered with Bleekemolen during the six-hour event were series regulars, Peter LeSaffre and Damien Faulkner. Difficulties during race dropped the trio to a fifth-place finish in their category – eight-laps behind the winning The Racer's Group entry driven by Bret Curtis, Emilio Di Guida and Sebastiaan’s brother, Jeroen.